"My family kept turning up their noses at my meatloaf. I tried several recipes in hopes of finding one that they would all like. They told it was just too darn plain for their taste. I tried adding oatmeal or rice instead of dry bread crumbs, adding different kinds of veggies, I used canned tomatoes, or ketchup, or tomato paste, or different styles of tomato sauce, even different spices until I came up with this one. When I saw all plates clean and being asked for more, I knew I had found the one they liked and the keeper for our family." Mix ground beef, Mexican-style tomato sauce, eggs, onion soup mix, bread crumbs, green chiles, garlic and herb seasoning, and garlic powder in a large bowl until thoroughly combined. Place mixture into a large loaf pan and shape into a loaf. Bake in the preheated oven until meatloaf is no longer pink inside and an instant-read meat thermometer inserted into the middle of the loaf shows at least 160 degrees F (70 degrees C), about 1 hour. I sometimes will even use 1/2 cup of grated carrots as well when I use bell peppers instead of canned diced green chiles. If I use bell pepper, I will also make up an envelope of brown gravy that I have added 1/2 cup chopped mushrooms to as well. Use all ground beef or 1 pound beef and 1 pound ground pork. I save a little tomato sauce (1/4 cup tomato sauce) to pour on top in the last 15 minutes of baking if I not going to make a brown gravy to serve with it. 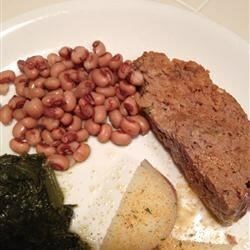 This was a nice twist on meatloaf, even my picky husband enjoyed it! Thanks for sharing! simple dish-great for the weekday meal. Perfect as " a little something different". I made this recipe as written with one exception. Instead of the using the hot tomato sauce I used one cup of a local made salsa. This recipe is definitely a keeper. Thanks for sharing this. My boyfriend said it was better than his mothers!!!!! What a compliment!!!! And all 4 of my children loved it too!! !